Some time ago I published a roundup of makers of hi-fi equipment based here in New Zealand. 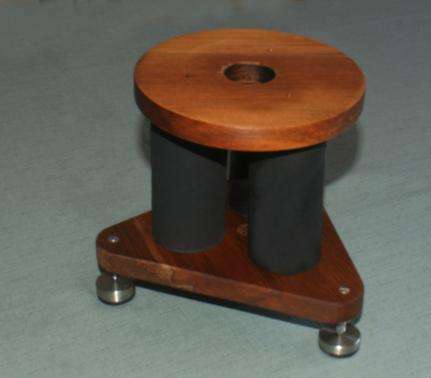 I have now met another local audiophile engineer artisan, Derek Nicholls, who may be known to those readers who are active in the Lenco Heaven forum. The brand name TemaadAudio may also be familiar since there is a previous review here at TNT-Audio by Geoff Husband in late 2012/early 2013. That was an audition of a turntable kit and arm (sadly now only the kit arm is available). Discussions on several audio forums reveal that Derek's tonearms are evidently appreciated widely. 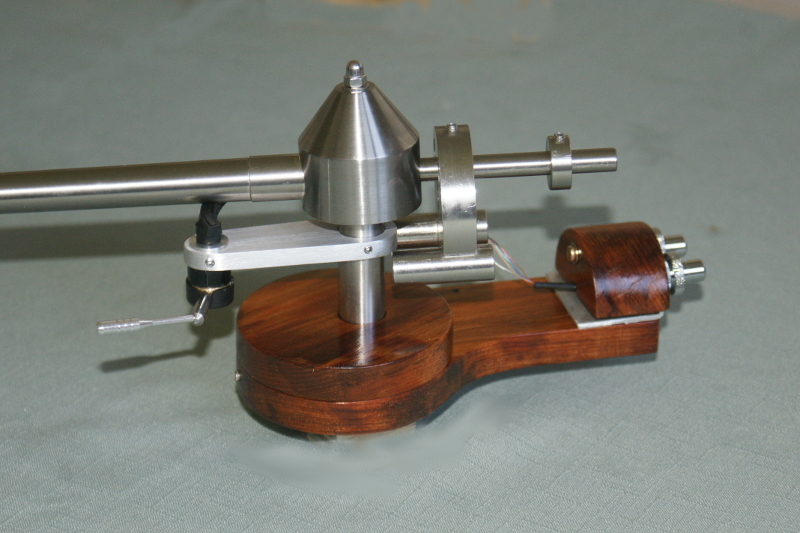 Over the past four decades I've been a devoted record listener, and I've used a range of tonearms, firstly a long-forgotten model, then an SME 3012. This was followed by a Linn Basik, then a Clearaudio Satisfy, and I currently enjoy the performance of The Wand Plus (also from New Zealand). This is not my first experience with a 12" tonearm, but it certainly is with a hand-made Titanium tonearm from Aotearoa (the Maori name for New Zealand). The TemaadAudio Merlin Reference 12" Titanium tonearm is the top of the range of arms designed and hand-made by Derek Nicholls. He set one up for my audition with an Onkyo MC-100 cartridge and a Graham Slee Gram Amp 3 Fanfare, on my The Wand 14-4 Turntable (from Design Build Listen). Then I tried the new Hana ML, before reverting to my Hana EL and a Gold Note Vasari Red. This arm is something special - designed and handmade by highly experienced engineer and audiophile Derek Nicholls. It's a visually striking 12" Titanium wand and body with a mounting cam collar of recycled Rimu wood, addressing friction, resonance, and Stylus Rake Angle carefully (note the far-from-horizontal playing position for the mounted Onkyo cartridge to play at its correct SRA). 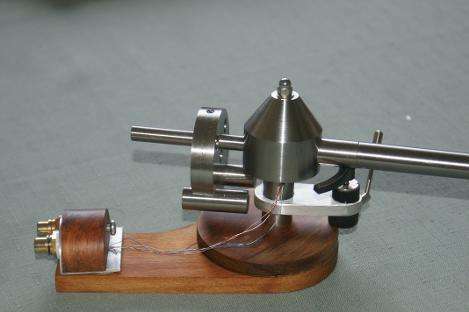 Titanium has properties that make it especially suitable for tonearm construction - high tensile strength, stiffness, toughness, and low density - i e. low weight. Indeed, it has the highest strength/density ratio of all metal elements. Titanium also has good resistance to atmospheric corrosion, so the arm doesn't tarnish/oxidise in normal use. The Merlin has an Effective length of 305 mm, Generic Mounting distance 292 mm, Overhang of 12.9 mm, and Offset angle 17.4 degrees. The Effective mass is 18 g, and this can be factory adjusted up to 24 g, free of charge). Internal wiring on the Merlin Reference uses Super High End Silver from Van den Hul, with Rhodium RCA output sockets. The Merlin can accept cartridge weight from 5 to 16 g. The height at the headshell can be adjusted to accommodate 20 to 60 mm height platters (depending on VTA required). TemaadAudio arms are a little different, in that there is no cartridge adjustment at the headshell. This is because slotting the arm or cartridge carrier weakens the very spot that should have minimum flex, and that does not allow your cartridge to retrieve music optimally. The Merlin arm is installed in an offset cam collar at the arm mounting plate. Rotation of this wooden shaft collar allows up to 20 mm of cartridge overhang adjustment. There are two arm options. The Merlin Reference arm, reviewed here, is fitted with Rhodium cartridge clips and RCA output sockets and what TemaadAudio consider to be the best internal wire available in the famous Van den Hul MC 150M Silver wire. Derek tells me that some enthusiasts even rewire their SME V arms with this wire! The Merlin Silver is a slightly cheaper arm, fitted with quality gold plated cartridge clips and RCA output sockets, and specially sourced super flexible silver wire. Derek assures me that the Silver option achieves 95% of the Reference arm's performance. The engineering is elegant and sophisticatedly simple and functional, and the finish is attractively 'handmade' in appearance, and it's so easy to use. The newly-developed pivot point mounting is also one of the keys to the arm's appeal and performance. It's made of extremely hard Ceramic, ensuring the absolute minimum friction and wear, and it's magnetised to firmly hold the pivot point down, thereby eliminating 'pivot point chatter' which has been the weakness of some uni-pivot arms. 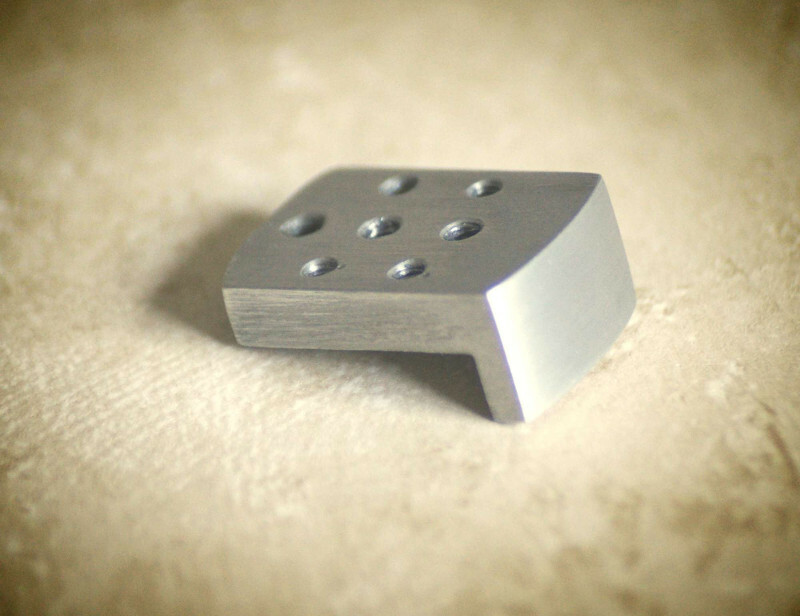 This magnetic bearing is standard on the Merlin arms, and an optional extra on the rest of the range. A special damping oil is provided for the bearing. This reduces the initial touch-down wobble every uni-pivot arm goes through when lowered onto a disc. TemaadAudio exclusively use a 12" format as it allows for a significant reductions in tracking error as the cartridge traverses the LP disc. Some will argue that this necessitates an increase in effective mass, yet the Merlin arm is only 18 g. A 10.5/11" arm can be produced by special order at no extra cost, and a 14" or 16" arm can also be produced if required. Having been back in the 1980s an SME 12" arm user (on a Garrard 401), I've revisited the concept (my usual favoured arm now is 9.5"). 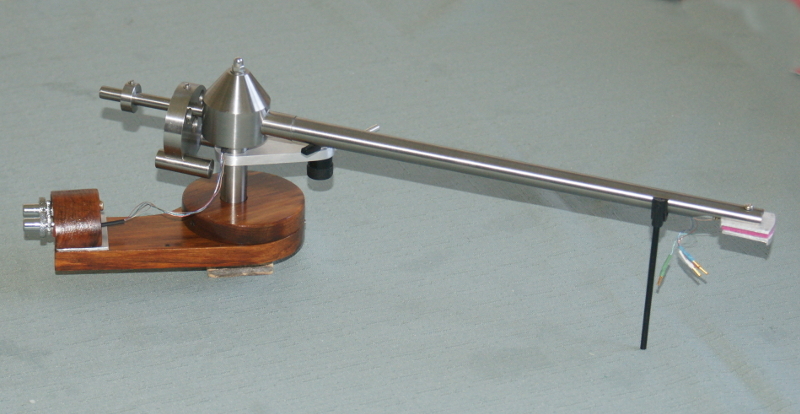 The 12" tonearm length geometry is renowned for its sound quality. Such an arm traverses a shallower arc across the record, therefore there is less distortion as the alignment is theoretically closer to ideal across a wider portion of the record than is the case with a shorter arm. 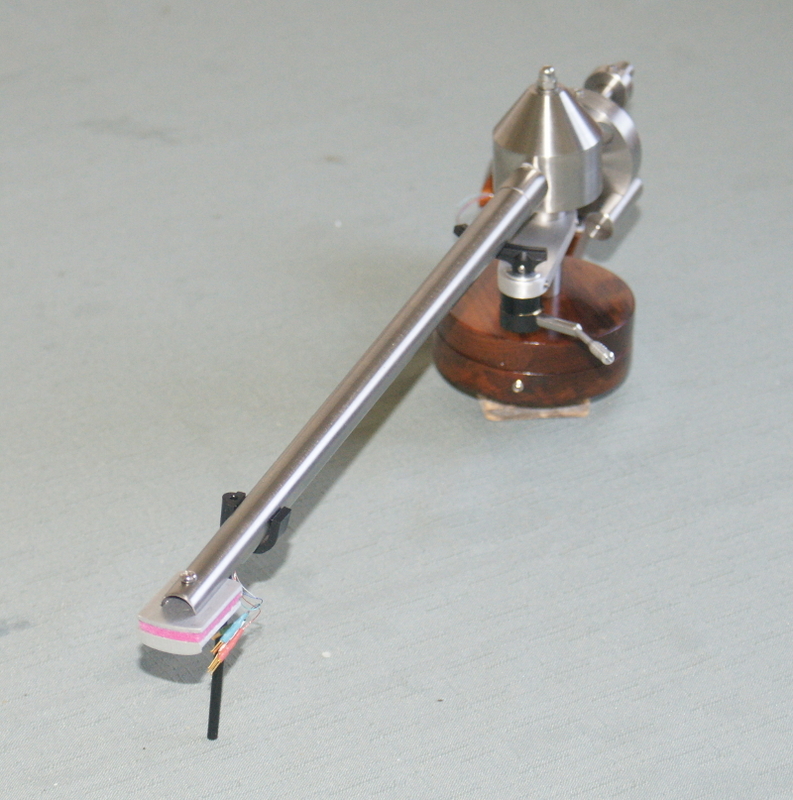 Ideally, a tonearm would track in a straight line across the disc surface, so that the stylus is perpendicular to the groove at all times, thus keeping distortion to an absolute minimum. But since the arm is fixed at the pivot, it traces a parabola across the surface of the record. The reduced tracking distortion of the 12" configuration delivers effortless, coherent, and smooth, relaxed, natural presentation, and added bass weight. Some argue that there will be a loss of speed and transient attack, but I don't hear anything like that. The usual downsides of the longer arm are higher moving mass, lower arm rigidity/greater resonance, higher counterweight inertia, and greater distortion caused by any misalignment. If you fit your cartridge using a standard alignment gauge and the body as a guide, and the stylus is misaligned within the headshell the distortion will be greater using the 12" arm as the distance from pivot to stylus is greater. Record wear is greater due to counterweight inertia, tracking on warped discs is worse due to a higher moving mass, and sonic degradation is caused by unwanted structural resonances in longer arms. These concerns have all been carefully and thoroughly addressed over years of arm development, culminating in the Merlin configuration. I've had the Merlin in use for a few weeks now, and I've learned through hours of listening experience that what's 'especially special' is the sound character and quality - instruments and voices are indeed distinctly discernable (I hear little smearing), tone is spot on, bass is firm and deep, sound image is big, full, and solid. Many recordings sound very immediate and lively, and complex 'busy' passages are well handled. My record playing is not sounding like a record playing, so it's 'easier'/more relaxed to listen to the music. I'm noticing it all most on drums and cymbals, electric and acoustic bass, piano, and room ambiance. The sound is very clean with clear separation, and a believable sound stage. I hear fine tonal balance, agile attack and decay, and a relaxed sense of lively, energetic musical flow. The Merlin is enabling my cartridges to dig up more details than I've ever heard on any combo of turntable/arm/cartridge. There is very pleasing air and delicateness of sound with an unmistakable musical flow. The stereo image is solid, even when the music isn't rock. Distinct characters of different instruments are especially obvious and coherently presented together. Some difficult music is listenable. Revisiting lots of old favourites has been a joyful experience. Next, I mounted a review sample of the new Hana EL cartridge. I'm a devotee of and regular user of the Hana EL, which is an exceptional performer (I've reviewed it previously here at TNT-Audio). The ML does everything I like about the EL, and even better. I realise that much of the listening pleasure is being produced by the way the music is rendered by the cartridge. This said, I've been impressed enough by what the Merlin does with my Hana and Gold Note Vasari cartridges, and the underlying design and construction ethos, to decide to keep it. Derek fabricated a cool-looking outrider arm pod for the Merlin from recycled native wood, so that, post-review, I can enjoy a choice between cartridges on my turntable. 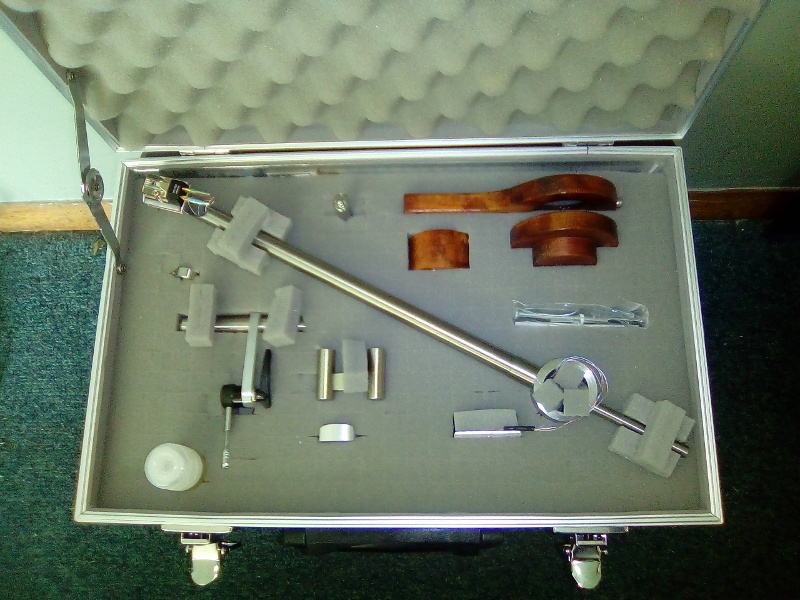 The arm is made to order, and supplied in a silver instrument case with a kit of accessories, including two headshells suitable for light and heavier cartridges, a set up rule, a cleaning brush and high-intensity light for stylus inspection, bearing oil, and a variety of small tools. Comprehensive set-up instructions are provided, as is a short paper discussing Derek's principles on stylus rake angle (SRA - the angle at which the stylus contact pad meets the disc groove surface) and a method for measuring and setting it correctly. Handmade silver wire interconnects, other accessories, and engineering drawings are also available. Derek's design and manufacturing expertise, and devotion to optimising the support of good cartridges is obvious in using the Merlin. Set-up is comprehensive, quite easy, and addresses performance concerns to ensure that pros are delivered with careful taming or elimination of cons from this tracking geometry. You can hear it right from needle contact with your record. The exceptional performance is quickly and easily recognised in auditioning The Merlin Reference with decent cartridges, and since Derek offers a money-back trial and personal advice on set-up, I strongly suggest checking out the forum discussions and then hear it for yourself. 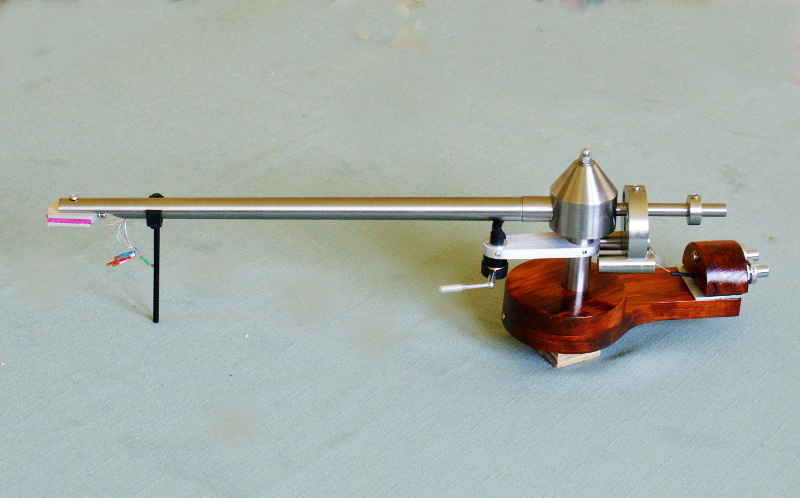 In my experience, this tonearm might just be a real treat for your turntable.